���� The Duel starts with a formal duel; in a small town in Texas in 1866 two men with their left wrists tied together fight with knives until one slumps to the ground, dead, his young son watching on; the victor is Abraham Brant (Woody Harrelson). Twenty-two years later that young boy, David Kingston (Liam Hemsworth), now a Texas Ranger, is summonsed to the Governor�s office in Austin. Bodies of Mexicans are being found in the Rio Grande near the border town of Mt Herman while others, including a Mexican general�s niece, have disappeared in the same area. The Mexican general is threatening to cross the border with his troops; the Governor orders David to go undercover to Mt Herman to investigate. The draw, for David, is that Mt Hermon is controlled by Abraham Brant, the man who killed David�s father and who now has a reputation as a healer and a preacher touched by God. ���� David�s wife Marisol (Alice Braga) refuses to be left behind so David reluctantly takes her with him. When they arrive at Mt Herman the townspeople are distant and unfriendly but Abraham seems to take a liking to David and makes him Sheriff, although Abraham�s son Isaac (Emory Cohen) is hostile. Abraham also takes a liking to Marisol, who falls ill but seems to be under his spell. The only person who will talk to David about what is happening in the town is the whore Naomi (Felicity Price), and she warns David that his life is in danger and that he should leave. But David stays and begins to uncover the dark secret at the heart of the town and its charismatic Preacher. But Abraham knows who David is, and a new duel is in the offing, a duel that may cost David his soul, his wife, and his life. ���� The Duel is directed by Australian Kieran Darcy-Smith, whose only previous feature film was the well-regarded Wish You Were Here (2012). He has a much broader resume as an actor, however, with roles on TV in such as Home and Away although he also appeared in Animal Kingdom (2010). I would say that as a director in The Duel he shows a great deal of talent. Although the film is a western due to its setting, The Duel is in many respects a psychological thriller that slowly develops the atmosphere of dread and tension, the camera panning over the muddy streets and buildings of the town with the inhabitants just sitting and watching, or going about their business. There are individuals framed in doorways, or in shadows, or seen through glass, emphasising the isolation of the outsiders. Indeed, this is a very dark picture as shot by cinematographer Jules O�Loughlin, a very different palate than his recent The Hitman�s Bodyguard (2017); in The Duel faces are frequently in shadow and during the night scenes either in the town, inside David�s cabin or in the countryside the background is often almost indistinct. This is in contrast to the daylight scenes, which are bright with vibrant colours. For all the light, there is a darkness in the soul of not only the town, but also David who is capable of extreme violence. The Duel is, indeed, also a western; the violence when it comes, including gunfights and the knife fights, is sudden, brutal and quickly over. One can think of the violence in Unforgiven (1992) � there is nothing balletic, noble or peaceful about death. ���� The Duel also benefits from two standout performances, although all the cast is strong. The youngest Hemsworth brother, Liam, probably best known for The Hunger Games franchise, is excellent while Woody Harrelson, nominated three times for Oscars, most recently for Three Billboards Outside Ebbing, Missouri (2017) but yet to win and also in The Hunger Games, makes most things he is in better, even Solo: A Star Wars Story! His Abraham is a softly spoken man who can dominate, and provide menace, with only his eyes. ���� The plotting of The Duel and the motivations of the characters sometimes seems incongruous, such as providing your enemy with a gun and ammunition and allowing him to ambush you, but the atmosphere, the action and especially the excellent actors on display more than makes up for it. ���� The Duel is presented in an aspect ratio of 2.40:1, in 1080p using the MPEG-4 AVC code. ���� As noted, inside the cabin of David and his wife during the night scenes, or outside on the streets, shadow detail is almost non- existent, while faces are frequently in shadow. As The Duel was shot digitally, this would be a deliberate choice. In contrast, during the daylight scenes detail is strong showing the dirt on faces, the blood and the muddy streets while elsewhere the colours are vibrant; the white of the houses, the green of the trees. Blacks are fine, contrast and brightness consistent. Marks and artefacts were absent. ���� There are no subtitles provided although sections of Spanish are automatically subtitled. ���� Audio is English DTS-HA MA 5.1. ���� This is a very active audio track. There is almost a constant buzz in the rears with the rain, wind, bird calls, insects and music while hooves are suitably thunderous, the gunshots loud, the thud of impacts of bullets on bodies or ricochets, or the crash of bodies resonates. Dialogue sometimes could be clearer, so subtitles would have been beneficial. The subwoofer added suitable depth to the hooves, shots and impacts. ���� The score by Craig Eastman was impressive, enhancing the mood and tones of the film. ���� Trailers for I.T. and Marauders play on start-up. They cannot be selected from the menu. ���� The Region A US Blu-ray of The Duel has an audio commentary by director Kieran Darcy-Smith and production designer Toby Corbett that we miss out on, plus Spanish and English subtitles. A win to Region A. 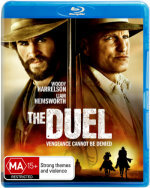 ���� The Duel is an impressive film, a western / psychological thriller with a mystery, an atmosphere of dread and tension, sudden, brutal violence, a good score and excellent performances by Liam Hemsworth and Woody Harrelson. This film has been around for a while but is well worth a look if you are interested in the genre or the actors, especially at the bargain price I have seen it being sold. ���� The video and audio are good. The only extra is trailers for two other films.